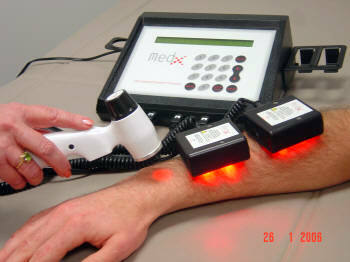 Laser photobiomodulation (LLLT) is the use of monochromatic light emissions from a low intensity laser diode (250 milliwatts or less) or an array of high intensity Super Luminous Diodes (providing total optical power in the 1000-2000 milliwatt range) allowing the body to effect its own repairs in order to treat musculoskeletal injuries, chronic and degenerative conditions and to heal wounds. The light source is placed in contact with the skin allowing the photon light energy to penetrate tissue, where it interacts with various intracellular biomolecules. Generally speaking, the bio-stimulating effect of laser therapy is in its anti-inflammatory, analgesic and anti-edematous effect on tissues resulting in the restoration of normal cell function and enhancement of the body's healing processes. Tietze's Syndrome (inflammation of the rib cartilage). 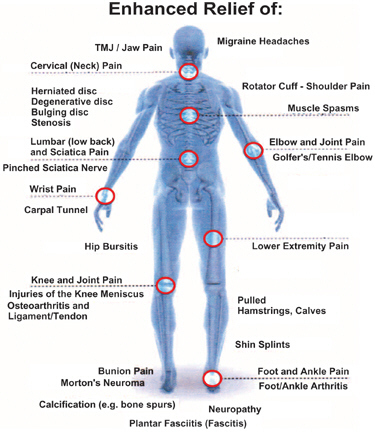 ** There may be some conditions listed above that are not within our chiropractic scope of practice and therefore not treated by Dr. Pisarek. As such, patients will be referred elsewhere.